October-Patch at Microsoft. 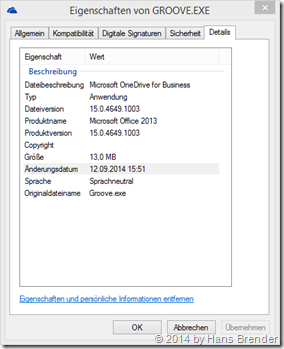 They fixed with the KB 3000731 the September-Patch KB 2809931 for OneDrive for Business. This Update is only for Groove-Installation, deployed as an msi-package. Office installation out of the cloud, known as C2R (Click to Run) have as separate update! After you run the Repair function in OneDrive for Business, you may find some empty folders in your archive directory. 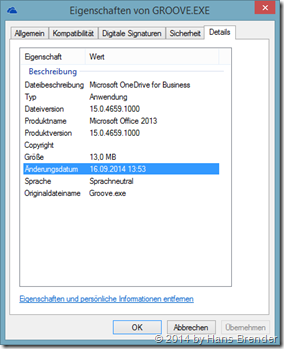 Assume that you use OneDrive for Business to synchronize files to an Information Rights Management (IRM) library. You use an Office application to create an Office document. You save the document by using the Save As function. You upload the file to the IRM library. In this scenario, when you perform a synchronization operation, the syncing process appears stuck. If you have had problems with the old September patch, you may have read in the internet, the only solution was, to uninstall the September patch. the new Version of the Groove.exe ( that’s OneDrive for Business) is 15.0.4659.1000 and the date is 09/16/2014, means only 4 days after the the release of the September version. “C:\Program Files\Microsoft Office\Office15”. There is the Groove.exe installed. I do not know, why Microsoft has fixed the errors in 4 days, but let us users wait 4 weeks with a fix.